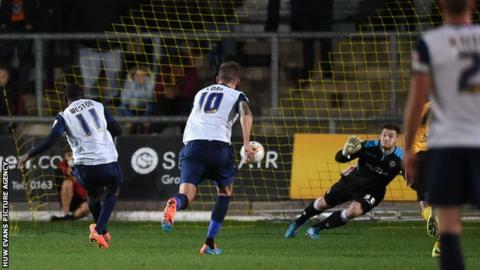 Mark Byrne's goal gave Newport County their third successive victory over Southend United, who were left to rue a missed penalty. After a tight first half, Southend were awarded a penalty when Kevin Feely was judged to have handled in the area. But County goalkeeper Joe Day guessed the right way to get two hands to Myles Weston's left-footed spot kick. Byrne then pounced to give Newport victory, smashing home Aaron O'Connor's knock-down. "It was a tough battle and the conditions played a part, but I'm delighted with the win. Match ends, Newport County 1, Southend United 0. Second Half ends, Newport County 1, Southend United 0. Attempt missed. James Loveridge (Newport County) right footed shot from outside the box is too high. Andy Sandell (Newport County) wins a free kick on the left wing. Corner, Newport County. Conceded by Jerome Williams. Corner, Newport County. Conceded by Daniel Bentley. Attempt saved. James Loveridge (Newport County) right footed shot from the centre of the box is saved in the bottom right corner. Substitution, Newport County. James Loveridge replaces Mark Byrne because of an injury. Substitution, Southend United. Jack Payne replaces Michael Timlin. Attempt saved. Andy Sandell (Newport County) right footed shot from outside the box is saved in the top right corner. Hand ball by Gary Deegan (Southend United). Foul by Joe Pigott (Newport County). Corner, Newport County. Conceded by Adam Thompson. Attempt blocked. Chris Zebroski (Newport County) right footed shot from a difficult angle and long range on the right is blocked. Goal! Newport County 1, Southend United 0. Mark Byrne (Newport County) right footed shot from outside the box to the bottom right corner. Substitution, Southend United. Lee Barnard replaces Myles Weston. Corner, Southend United. Conceded by Michael Flynn. Corner, Southend United. Conceded by Joe Day. Penalty saved! Myles Weston (Southend United) fails to capitalise on this great opportunity, right footed shot saved in the bottom left corner. Penalty conceded by Kevin Feely (Newport County) with a hand ball in the penalty area. Substitution, Newport County. Michael Flynn replaces Max Porter.